Today's mission is to declutter your child's backpack. Below are some easy instructions to follow for this mission, plus more tips for making this a habit since it is not the type of mission you can do just once in a year! This mission is designed to be done during the Back To School Organization Challenge, which is here on the site as part of the 52 Week Organized Home Challenge. It's back to school time, so if your kids are like mine they haven't been in school very long yet. That means it hopefully won't take too long to declutter and reorganize their backpack, since there hasn't been too much time to accumulate a lot of junk and trash yet! When discussing this mission I often refer to "you" doing something, but for any missions involving kids' stuff, I want to make clear your kids should be involved. They at the least should assist and participate, and for older kids they may be able to do the mission completely by themselves. Participating and helping are the perfect way to teach them the life skill of keeping this bag organized and clutter free. They can then transfer this skill later not just for backpacks, but for a purse, gym bag, diaper bag, briefcase, or whatever else they carry! Here's the simple steps for completing this mission. Take everything out of the backpack. 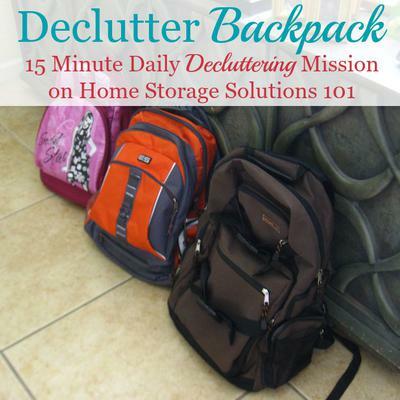 Sometimes when doing a decluttering project taking everything out at once can be too overwhelming, but backpacks are typically small enough that this step makes it easier. Make sure to get everything out of all the pockets and compartments, not just the main compartment. Once everything is removed from the bag begin to sort through the items. Remove trash and broken supplies. Put back any school supplies, such as pens, erasers, etc. in an organized fashion. You may want to purchase a small pencil bag for these items so they aren't loose in the backpack where they easily get lost or ruined. Next straighten and neaten binders and folders, first taking out any school papers that no longer need to be in there. Place these school papers that are no longer needed to the side for now. I'll discuss more, below, for what to do with them. Replace the neatened and tidied folders and binders back into the backpack. Make sure when replacing items back into the backpack that you're not decluttering that you seriously consider how much the backpack weighs. Does you child really need to carry all this stuff around? Getting rid of excess weight is important, not just for comfort, but also a child's health. Overly heavy backpacks full of clutter and trash are not good for your growing child's back and shoulders. Below I've discussed more about what to do with school papers that quickly accumulate as you remove them from your child's backpack in each decluttering session. As I mentioned above, decluttering your kids' backpacks and school bags is not something you can do just once a year and everything be great the rest of the time. I'm sure you're aware of how quickly book bags get junked up, so this is something that needs to be done habitually. So the other part of this mission is focused on developing a good habit to keep up with this task. Kids need to be involved in creating this habit, because eventually the goal is that you're not doing it at all, but instead your kids are doing by themselves, independently. 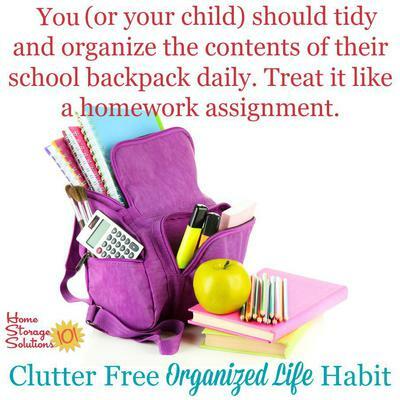 Learning how to maintain an organized and clutter free space, even one as small as a backpack, is a great life lesson, so I encourage you to work on this with your kids. It will make both their school lives, and yours, better and easier! My recommendation for keeping your child's backpack clutter free is to deal with it daily. Treat it as a homework assignment, and tidy the backpack and contents each day when your kids come home, while everyone is working on homework. That may sound onerous, but really it makes it super simple, because when you do it daily we're talking about something that takes between 30 seconds and two minutes to accomplish. On Fridays, if your kids' schools are like mine, it might take a bit longer since that is when lots of papers come home. But you need to go through them anyway to look for things to add to the calendar, review homework assignment grades, sign permission slips, etc. So just piggyback this task of decluttering the backpack on top of it, and this will still only be a small amount of time invested. Each day glance at the binders and folders to see what papers have come home and deal with them, and pull out all old school papers. Throw away trash, neaten and straighten, and then you're done. Easy peasy. What To Do With All The School Papers? The big thing that you have to deal with when keeping your backpack clutter free is having a system to habitually deal with school papers. What you don't want to do is take them out of the backpack, but then put them on some flat surface in your home and forget about them. Then they become your paper clutter, and that is not actually helping! When in doubt ask yourself these 6 questions when decluttering school papers so you can feel at ease about what you've decided to keep versus toss. Then, have a designated folder for all school papers you plan to keep, and as you clean out the backpack place those papers in that folder. Set up a new folder for each child at the beginning of the school year, and you can fill it up all year long. At the end of the school year, or sooner, if you feel like you've accumulated too much, you can declutter more. But having a designated place for the papers as they accumulate keeps them from being added to stacks on your kitchen table, dining table, kitchen counters, or other places where they're in the way. You can get even more ideas of how to deal with your kids' school papers here, in this article on the Household Management 101 site. This simple habit, of dealing with your kids' backpack contents, including school papers, daily, will go a long way toward making your kids' homework routine so much easier to manage, as well as reducing a significant source of paper clutter in your home. 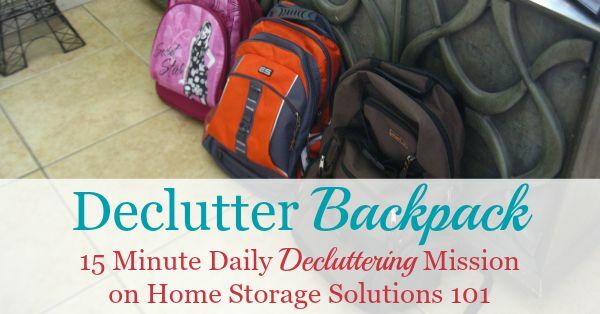 I hope this article has inspired you to get your kids' backpacks and school bags decluttered and to keep them that way. Save papers for cumulative exams! Unfortunstely, where I teach high school, many classes are year long and have cumulative exams. While not every paper has to be saved, some notes should be so the child can review at the end of the year.